How did a Massachusetts woman end up with two electrodes implanted into her brain? Why is the Defense Advanced Research Projects Agency developing a controversial, cutting-edge brain chip technology that could one day treat everything from major depressive disorder to hand cramps? How did we get to deep brain stimulation and where do we go from here? In 1848, a rail foreman named Phineas Gage was clearing a railroad bend in Vermont when a blast hole exploded, sending the tamping iron he had been using to pack explosives through his left cheek, his brain’s left frontal lobe and finally out the top of his skull before landing 25 yards away, stuck upright in the dirt. Despite his pulverized brain mass, Gage went on to make a full recovery, with the exception of a blinded left eye. It was, by all accounts, miraculous. Gage’s case was the first to suggest the link between the brain and personality—that the brain is intimately connected to our identity, our sense of self. A portrait of Phineas Gage holding the tamping iron that injured him. Image: Phyllis Gage Hartley/Creative Commons. Since then, science has frequently exploited that link in the name of (sometimes misguided) self-improvement. Change the brain, and change the self. Once-common but in hindsight abhorred lobotomies were the first treatment to offer relief from mental illness by disrupting the brain’s circuitry, severing the connections to and from the prefrontal cortex. Electroconvulsive therapy, a once-cutting edge treatment now reserved for extreme cases, sends a shock of electric current through the brain for a near-instant change in its chemical balance. Antidepressants target neurotransmitters like serotonin to affect mood and emotions. As we have unpacked more thoroughly the mysteries of the brain, we have become better able to precisely target the changes we want to affect. This is how Liss Murphy wound up with two 42-centimeter-long electrodes implanted deep within the white matter of her brain. For years, Murphy had suffered from severe depression that seemed untreatable—rounds of Effexor, Risperdal, Klonopin, Lithium, Cymbalta, Abilify, electroshock therapy and even an adorable new puppy failed to get her up out of bed. Then doctors offered her a new option, something called deep brain stimulation. On June 6, 2006—6/6/06—doctors at Massachusetts General Hospital drilled two holes into Murphy’s skull and implanted two electrodes into a dense bundle of fibers within her brain’s internal capsule. The axons here carry signals to many of the brain’s circuits that have been linked to depression. Those electrodes were then connected to two wires that ran behind her ears and under her skin to her clavicle, where two battery packs just slightly larger than a matchbox were implanted to power them. When turned on, the hope was that the electrical signals emitted by Murphy’s new implants would in effect re-wire the circuits in her brain that were causing her to feel depressed. It worked. Murphy became one of the first people in world successfully treated for a psychiatric illness using deep brain stimulation, in which electronic neurostimulators are embedded deep within the brain to correct misfiring signals. Like Gage, the experience changed her, but for the better. She got out of bed, had a kid, and went back to work part-time after years of being able to barely leave the house. Deep brain stimulation is the bleeding edge of mental health treatment. Originally developed to treat the terrible tremors that patients with Parkinson’s disease suffer from, many researchers now view it as a potentially revolutionary method of treating mental illness. For many patients with mental health disorders like depression, therapies like drugs are often insufficient or come with terrible side effects. The numbers are all over the place, but doctors and researchers generally agree that significant numbers of people don’t respond adequately to current treatment methods—one often-cited study pegs that number somewhere around 10%-30%. But what if doctors could simply open up the brain and go directly to the source of a problem, just as a mechanic might pop open the hood of a car and tighten a loose gasket? Now, the same team that implanted electrodes into Murphy’s brain is halfway through a five-year, $65 million research effort funded by the Defense Advanced Research Projects Agency to use the same technology to tackle some of the trickiest psychiatric disorders on the books. The goal is ambitious. DARPA is betting that the research teams it is funding at Mass. General and UCSF will uncover working therapies for not just one disorder, but many at once. And in developing treatments for schizophrenia, PTSD, traumatic brain injury, borderline personality disorder, anxiety, addiction and depression, along the way their work also aims to completely reframe how we approach mental illness to shed new light on how it flows through the brain. Unfortunately, it’s not quite as simple as all that. For starters, psychiatric illnesses are complicated, and often not all that well understood in terms of where they exist in the brain. For more than a decade, DBS has been used in patients with Parkinson’s disease, but targeting the brain’s motor cortex to manage Parkinson’s violent trembling is a lot less complicated than targeting, say, depression. A diagnosis of major depressive disorder requires that a person exhibit five of nine symptoms, but two people could be depressed and have almost no symptoms in common. That means that for those two people, treating depression with deep brain simulation might require stimulating entirely different regions of their brain. And there is still disagreement about what those regions even are. Rumors have swirled that the DARPA’s real goal in all this research is to create enhanced super soldiers. The agency has several other brain computer interface projects, which seek not just to use chips to treat mental illness, but also to restore memories and movement to battle-wounded soldiers. A 2015 book about about the history of DARPA, “The Pentagon’s Brain,” suggested that government scientists hope that implanting chips in soldiers will eventually unlock the secrets of artificial intelligence and allow us to give machines the kind of higher-level reasoning that humans can do, or allow soldiers to perform feats like waging war using their thoughts alone. DARPA, though, has maintained that its main goal is to develop therapies for the many thousands of soldiers and veterans with wounded brains. An X-ray of a monkey’s head in which neuroscientist Jose Delgado implanted electrodes arrays in the frontal lobes and the thalamus. Image: Physical Control of the Mind by Jose Delgado. Murphy was among the first mental health patients to be successfully treated using DBS, but the idea that we might use electrical signals to right our sometimes faulty wiring is by no means a new one. In the 1970s, a Yale University neuroscientist named Jose Delgado implanted radio-equipped electrode arrays—he called them “stimoceivers”—into cats, monkeys, bulls and even humans. His work demonstrated that electrically stimulating the brain could elicit movement and on occasion even particular emotions. In one now famous experiment, Delgado agitated the temporal lobe of a young epileptic woman while she calmly played the guitar, prompting her to react by violently smashing the guitar against the wall in rage. 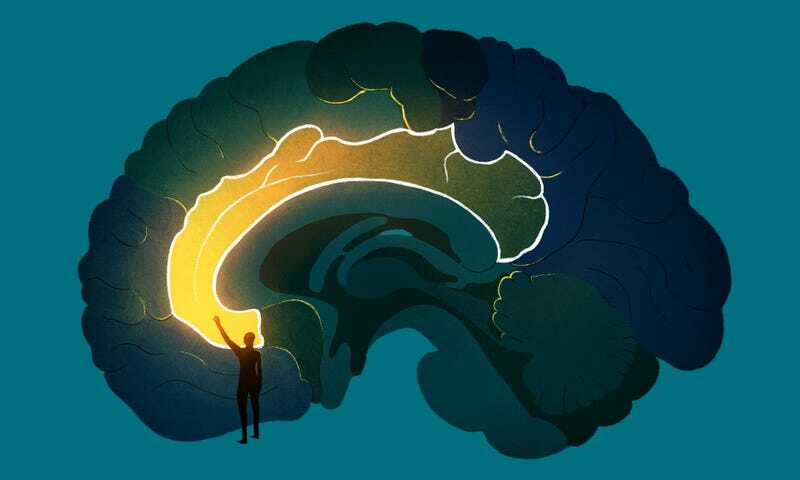 Less sensational, but more promising for clinical purposes was Delgado’s research that found stimulating a part of the human brain’s limbic region called the septum could invoke euphoria strong enough to counteract depression, and even pain. In 1970, The New York Times Magazine hailed Jose Delgado as the “impassioned prophet of a new ‘psychocivilized society’ whose members would influence and alter their own mental functions.” They also called it “frightening.” His work eventually became engulfed in controversy. Strangers accused him of having secretly implanted stimoceivers into their brains. Delgado, who was Spanish, left the U.S. shortly after Congressional hearings in which he was accused of developing “totalitarian” mind-control devices. His work receded into the archives of history. More recent forays into deep brain stimulation began in 1987, when a French neurosurgeon named Alim Louis Benabid was preparing to remove a piece of the thalamus in a patient who suffered from severe tremors, a then-common practice known as lesioning that aimed to calm problematic areas of the brain by surgically damaging them. While probing the thalamus to ensure he didn’t accidentally remove something crucial, he inadvertently discovered that jolts of electricity could stop the tremors, no brain damage necessary. A little more than a decade later, the U.S. Food and Drug Administration approved DBS for use in patients with Parkinson’s disease. Today, there are over 100,000 Parkinson’s patients with tiny chips in their brain to control their symptoms. Parkinson’s is still the most common use of DBS. In 2009, the FDA approved a humanitarian exemption to allow patients with severe obsessive-compulsive disorder to receive implants. All other uses of DBS are considered experimental. Case studies of patients who have received the treatment have shown that those implants sometimes have severe side effects. In one case study, a 43-year-old man suffering from debilitating Tourette’s Syndrome received DBS. His doctors targeted well-known areas of the brain considered safe for treatment in order to relieve his tics. And it worked. But a year after the operation, he began to dissociate from his previous self. Doctors observed that increasing the amount of electrical stimulation in his brain resulted in him “anxiously crouching in a corner, covering his face with his hands” and speaking “with a childish high-pitched voice.” When it was decreased, he went back to normal, with little memory of what had happened. A 2015 review of cases using DBS to treat Tourette’s found that Tourette’s patients seem more likely to experience post-DBS complications, but ultimately concluded the treatment still seemed promising, citing successes. Stimulating a part of the human brain’s limbic region could invoke euphoria strong enough to counteract depression, and even pain. In some cases, DBS seems to bring on side effects like a decline in word fluency and verbal memory, depression, increased suicide tendencies, anxiety and mania. In other cases, like Murphy’s, though, there seem to be really no changes in personality at all. A common argument is that DBS, unlike a lobotomy, can be turned off by switching off the electric current flowing to the brain. A patient could always simply let the battery run out. But some evidence suggests it actually does cause long-term, irreversible effects, like damaging brain tissue. The full extent of those effects are yet unknown. Doctors who treat patients with intractable conditions make the case that DBS is a much-needed treatment only being used to treat patients for whom it is their last resort. Many neuroethicists, though, counter that its negative effects are still poorly studied and often downplayed in both academic literature and the press. Really, at this point it’s hard to know what might happen. Gage is often trotted out as cautionary tale of what might happen when messing with the brain. But recent historical work has begun to suggest that eventually after his accident, he actually returned to a basically normal life, weird personality tics and all. One scientist who studied him throughout his life observed that he “quite recovered in his faculties of body and mind.” A recent book about Gage suggests that, over generations, his story had been embellished to tell the legend of a man who suffered a brain injury and saw his humanity vanish. Instead, it may really be a tale about the brain’s incredible ability to heal itself. Perhaps a more immediate risk, though, is that deep brain stimulation will simply not be as effective as we dream it will be. Monkey in which neuroscientist Jose Delgado implanted electrode arrays. IMAGE: Physical Control of the Mind by Jose Delgado. Dr. Emad Eskandar, a neurosurgeon at Mass. General and one of the lead researchers on the DARPA project, has been working on using DBS to treat mental illness for over a decade. He was the one who implanted those two electrodes into Liss Murphy back in 2006. But while for Murphy and many other patients the treatment seemed to work, a clinical trial revealed that the treatment had a significant placebo effect. In a study of 30 people conducted in the mid-2000s, participants who received DBS did not improve at a rate much better than those who did not, and the FDA halted the trials. Eskandar told me that they eventually realized that they were thinking about it all wrong. That was the aha moment that moved them to reframe their research entirely. Instead of trying to treat a psychiatric diagnosis, like depression, they decided to focus on treating the particular symptoms that a person exhibited. “It’s much more tangible for us to measure things like ‘Are you cognitively flexible or rigid? Are you emotionally flat?” he said. Two years in, their work has identified patterns of activity in certain areas of the brain that seem to correlate with specific traits, but they still need to home in on exactly which frequency band is the right signal to target. One recent revelation at Mass. General was that cognitive flexibility, decision making and approach avoidance—traits associated with several disorders—are all located in one part of the center of the brain known as the striatum. Luckily, it was a region of the brain already known to be safe for electrical stimulation. Some traits, though, are easier to locate in the brain than others. Impulsivity, for example, a major trait in most people with addiction, is easier to pinpoint than symptoms like fatigue or physical pain. “The 30,000-foot view is that we have pretty good data for the set of domains we are treating,” said Darin Dougherty, a psychiatrist at Mass. General and Eskandar’s long-time collaborator. Ahead, though, are still likely years more of fine-tuning. Their second hurdle, on top of figuring out where in the brain to target, will be to design a plan for how best to stimulate that spot. Murphy’s implant is what’s known as “open loop”— her electrodes send out signals to her brain, but the brain isn’t sending any signals back. Her implant works in some ways much like a drug, delivering a single, constant electrical stimulation, albeit one targeted at a specific area of the brain. In hopes of targeting the brain more precisely, the Mass. General team has enlisted Boston’s Draper to design a “closed loop” implant to replace the old system. A closed loop system would work much more like the brain itself, both sending and receiving information to multiple sites of the brain in a natural, dynamic fashion. This would allow the electrodes to only fire off a signal when necessary, meaning patients would only receive treatment when their brains are sending out the signal responsible for unwanted behavior. Last November, I visited Mass. General, where Widge showed me the fridge-sized machine that housed the algorithms behind the team’s DBS technology. Draper will have to figure out a way to fit those complex algorithms onto a device smaller than a cellphone. With the new system, the entire DBS unit, including rechargeable batteries, will be implanted on the back of the skull. The implant will contain five electrodes, with 64 points of contact allowing them to target the brain with incredible geographic specificity. Those electrodes will gather data from the brain, process it, and then administer the appropriate dose of stimulation accordingly. In January, the FDA gave the Mass. General team approval to, for the first time, hook a prototype up to a patient. Right now it’s still about the size of a brick, far too big to implant permanently. The plan is to hook it up to the patient and test it temporarily, at first for a few hours, and eventually a few days. The goal is that by the end of DARPA’s five year contract, they have both a device and protocol ready to be put to the test of an FDA clinical trial. Widge told me that he imagines their device one day being sophisticated enough that patients could control some settings via an app, giving them control over how much psychiatric assistance they receive on a day-to-day basis. Listening to patients like Murphy describe their experience—a sudden lightness, an immediate surge of warmth—it’s hard not to wonder whether, in tweaking a person’s circuitry, we aren’t also altering something at their core. Murphy, though, disagrees. She actually finds the term “cyborg” offensive. Why Did Scientists Wait Until Trump to Run for Office?